Researches on whether female fertility determines labour force participation or vice versa have reached mixed results. A high participation of females in the labour market can limit the family size, and conversely, low female fertility can free up their time and increase their participation in the labour market. As such, this paper sets out to answer the question of “What causes what?” Having established the existence of cointegration for Malaysia, Singapore, Thailand, the Philippines and Indonesia (hereafter ASEAN-5) using time-series data for the 1980 to 2012 period and also for a panel for the ASEAN-5 countries, we found the presence of bidirectional causality between female fertility and female labour force participation. Other studies (Mishra & Smyth, 2010; Salamaliki, Venetis, & Giannakopoulos, 2013) concur with this results. 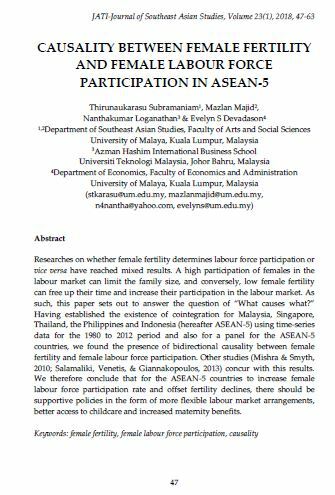 We therefore conclude that for the ASEAN-5 countries to increase female labour force participation rate and offset fertility declines, there should be supportive policies in the form of more flexible labour market arrangements, better access to childcare and increased maternity benefits. SUBRAMANIAM, Thirunaukarasu et al. CAUSALITY BETWEEN FEMALE FERTILITY AND FEMALE LABOUR FORCE PARTICIPATION IN ASEAN-5. JATI - JOURNAL OF SOUTHEAST ASIAN STUDIES, [S.l. ], v. 23, n. 1, p. 47-63, june 2018. ISSN 2600-8653. Available at: <https://jati.um.edu.my/article/view/12186>. Date accessed: 20 apr. 2019. doi: https://doi.org/10.22452/jati.vol23no1.3.